For those of us who do not watch the transaction wire, anxiously awaiting the Tampa Bay Rays’ next acquisition (I say “us” as a matter of formality, for by the mere presence of this article we can ascertain I am not among those abstainers), last night the Tampa Bay Rays came to terms (terms yet-revealed) with infielder Jeff Keppinger. Ultimately, the final question must be this: How is Jeff Keppinger — who seemingly shares the same strengths as Sean Rodriguez — in anyway useful to the club? When I first heard the Rays had signed Kepp, I was sure it was to a minor league deal. Keppinger is coming off a 0.4 WAR season and has a career rate of 1.4 WAR per 600 PAs — not the model of amazingness. NOTE: I’m the one who added all that red business. So hitting-wise, Keppinger is seemingly an inferior version of Rodriguez — moreover, Rodriguez, in both scouting and UZR terms, is the superior defender. Where does that leave Keppinger? Okay, first of all: Keppinger is the better hitter. So far. Because Collette is regressing those numbers, and because Sean has 1000 PAs to Jeff’s 2200, his numbers are better on the merit of the league averageness he’s regressed against. But league average has a survivor bias inherent in it, so maybe Rodriguez isn’t good enough to stay in the league and his numbers are worse? Unlikely, but possible. Secondly, there is the matter of usage. Keppinger played full time and has played 71% of the time against his foil — right-handers. S-Rod meanwhile has been limited against righties when possible, facing them only 64% of his PAs. Secondly: Handedness platoon splits are not the only platoon splits of significance. The Rays have three infielders vying for playing time (Ben Zobrist, he of the 4-WAR minimum, does not vie; he gets). NOTE: I’m using Should Hit here as a proxy for regressing their numbers. It does, in my early opinion, a smashing job. 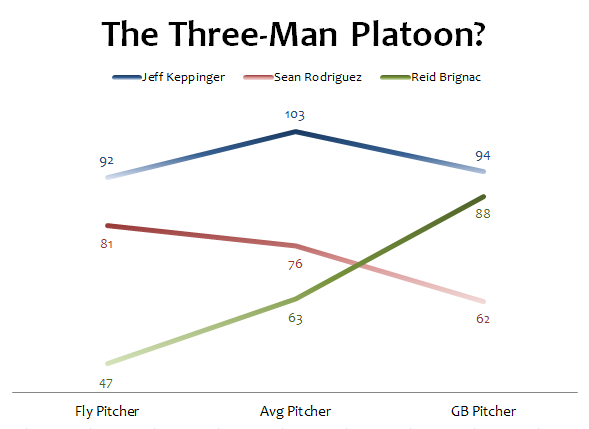 Both Brignac and Rodriguez appear to be considerably superior defenders to Keppinger, so consider the gaps between Briggy/S-Rod and Kepp as the Defensive Compromise. Reid Brignac, with his gargantuan uppercut swing, has shown an early proficiency against ground-ball pitchers, and has been a pop-up, easy out machine against the fly-ball variety. With a more level swing, Rodriguez has shown tendencies in the opposite direction, while Keppinger seems to be the middle of the two. Could these lead to the league’s first three-man infield platoon based on GB/FB tendencies? Joe Maddon has employed crazier tactics in the past — and has employed more than one GB/FB platoon in the past — but it might be a little beyond what’s necessary. At some point, divvying up the playing time that much means none of the players gets consistent playing time and they all suffer in their production — but who knows? Maybe Maddon trots out the Three-Man Platoon against an extra-groundballish or ultra-normal pitcher? Kepp’s presence means the team can continue to platoon Matt Joyce (who struggles against left-handers) by sliding Zobrist to right and putting Rodriguez and Keppinger at short and second, respectively. Against righties, Kepp hits the bench, Joyce goes into right, and either Rodriguez or Brignac — possibly, if he’s not in Durham — take short. It is a lot of moving parts, but moving parts is that which Joe Maddon excels at doing. Either way, I must say I am impressed by a signing I initially thought of as befuddling. And that is just so Rays. We hoped you liked reading The Most Talked About 23rd Man: Jeff Keppinger by Bradley Woodrum! I would like to point out just one factual error. The Giants did not HAVE TO use Keppinger nearly full-time, as they could have platooned him with Mike Fontenot at 2nd. They CHOSE to play him nearly full-time. Had they used him correctly, he probably would have been a mildly useful player for them. This would have dove-tailed neatly with platooning Crawford with (Ugh!) Tejada at short. Oh Giants, why you so crazy? Because Keppinger has the sure footedness and speed of Frankensteins monster going to his left. He made me crazy. God my team is run by morons.